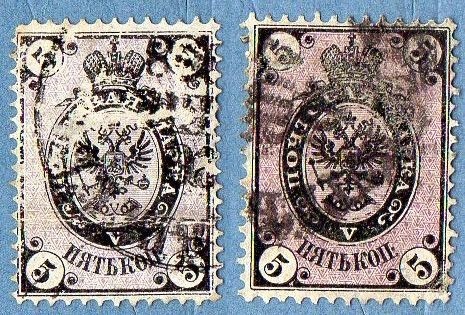 In this post I like to share with you some 'oldies' from Russia...It is a group of stamps of the commonly called "Eagle and Crown" Series.. it is a vast and 'tricky' group of series, with lots of small differences in a picture that look's more or less the same with time...So, I have these stamps before me , and I am asking myself .. How do I start?? where do I start ?? after some quick thoughts , I realized that I should start from highlighting what is common to all of these series and dividing the stamp into some 'hot' points where all the action will take place... to begin I will describe the stamp in words and then present an image to clarify some points..
starting from the center of the stamp, we have a crowned double-headed eagle with it's wings wide open and in the left claw, the scepter and in the right one , the Globe...At the Heart of this strange animal there is something that remembers a coat of Arms (A small squared figure..it begins to 'sound' strange because the figure in it's totality meant to be a coat of arms..! ) ...At the Eagle's feet there are two post horns..At the corners of the stamp, there are numerals..between the oval figure and the frames of the stamp there is what I call the ' External Background' (because there is also a 'internal Background' inside the oval figure...)..of course we have to count also with the labels inside the oval frame and in the 'External Background' ... from the superior Oval Frame ,a beautiful Imperial Crown is born , so whatever is inside the Oval figure, is Crowned twice. !.Of course all of this is Heraldry Territory, with all the hidden significance's and other assorted mystery's.. This will be a post not dedicated to show the final data of the stamps , but more to explain some of my personal approach to these series...I've worked with a lot of stamps as you can see in the pictures below , but most of them I already had in the collection, so there is a relatively small number of new entries...I will keep many of them in the collection as stamps with small variations in color.. I would like to begin , by leaving here some important data about this large group of series..
3) There are two main designs that coexist's in almost all of the series...The type F2 stamp is used since 1857 in values equal or superior to 10k.. 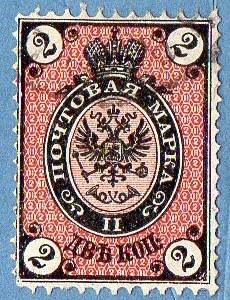 In the 1875/1879 series it is also used in values superior to 5.(F1). From 1899 to 1917 some additional lines in the form of small lightning bolts appear together with the image of the small horns below the Eagle..
To complete all the data we need to study carefully our stamps, we need to know that some differences exists with time in the stamps F2...the labels below the oval figure appear with different forms (don't bother with what is written but how it is displayed..) ; we need to know that two different F2 types never coexist in the same series..! search for the presence or not of the Hor/Ver lines in the back of the stamp..
What is the type of the stamp (E1,E2,F1,F2) ? at this level we should be working with smaller and better defined time frames. apply the 'external background' differences in E1 or the label differences in F2 types.. 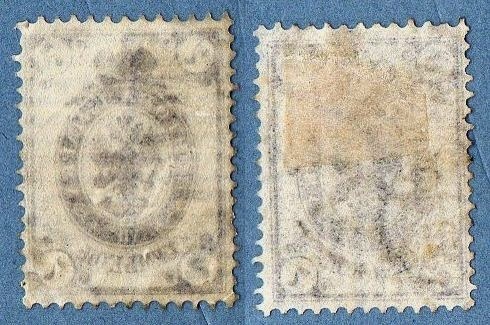 I have here 5 F2 type's.. the first three of them are F2(A) and the others F2(C)..the first two stamps differ from the third because of the non existence of visible lines in the back of the stamp..; I'm going to quote Stanley Gibbons Catalog to explain the overall condition of stamp 1.. " between 1858 and 1883 some of these stamps were printed on a specially prepared paper coated with chalk as a precaution against fraud. The strength of the applied solution varies, being in some cases so thick that the printing ink did not penetrate to the paper, with the result that if immersed in water, the picture dissolves." ; I think it was clearly what happened to this stamp.. it has no numerals visible , but it can only be a 10k stamp, and the perforation is 14.5 (no Wmk), so it is from the 1865 series (Sc 15a [the a is for thick paper..]).. same thought's about the 30k stamp ( Sc 18).. The 4th stamp is Sc (61) [Vertical lines, F2(C) and Perf 14.5].. The 5th is Sc(64) [same thinking..]. I'm tired and just to end , I need to say that more designs are available in the 'lightning bolt' series, but I prefered to remain focused in these two main designs..., for now! !..